The Need to Look Good! Who does not want to look good? Good looks help you feel better. It brings back the zing in the life when people turn to look at you. One of the major factors for good looks is the body figure. Even if you have a beautiful face, a bulging belly or fat thighs will always destroy the overall look. It is so difficult to keep in shape at any age. A teenager is getting obese. There are lots of factors which contribute to the increase in the fatty tissue of the body. Now a day there is hardly any compulsion of manual work. Most of the people work either in offices, all kinds of labor it did with the help of machines, where it is cleaning the house or trimming the garden. All work has become no sweat job. People sitting in offices have almost no physical exercise. Now more and more offices have gyms but who has time to go the gym and work out. Besides, there are all kinds of tempting food that will ruin your body contours. It is so difficult to keep the control and life out of your food. TV and video gaming is another factor that adds to the belly fat and encourages sedentary lifestyle in the young adults. One of the most important factors is the stress; it causes hormonal disbalance and lets to compulsive eating disorder. And then the weights start increasing. The problem is how to control weight or reduce weight. There are many options available in the market – from herbal remedies to operative procedures. Unfortunately, most of the weight loss programs fail to give a standard result, same goes for the diet plans. Besides they don’t have stable results, most of the people increase weight dramatically, once they stop exercising. Many times strict diet plans lead to malnutrition and related diseases. Dr. Giorgio Fischer, invented the liposuction back in 1976, in Italy. Further, it was improved by French physicians – Illouz and Fournier in 1978. By 1980s, liposuction became a fad in the USA. However, there were certain concerns associated with liposuction. The major concerns were excessive bleeding and skin rippling after the procedure. Tumescent Technique – it is a technique developed by Dr. Jeffrey A. Klein, in 1985 after this invention, the liposuction surgery was revolutionized. This technique allowed patients to have surgery based completely on local anesthesia and not deep cuts. Much smaller canals could be used in this technique. The two negative points – excessive bleeding and the skin depression was effectively reduced by the use of this technique. In this technique, anesthesia is given large pockets of subcutaneous fats. Due to excessive bleeding, patients had to GET BLOOD transfusion because of a large amount of blood loss in the suction procedure. But because of local anesthesia, also prevents an excessive use of intravenous narcotics and sedatives. Liposuction is also called suction assisted lipectomy. It is basically used to remove specific areas of the fat deposit. These are the areas which are normally resistant to change from diet or exercise. It is not exactly a treatment for obesity or a complete body weight management system. A liposuction treatment can remove fat deposit in the areas like Abdomen, Upper arms, Back, Outer thighs (saddlebags), Inner thighs, Hips, Buttocks, legs etc. These are the areas of frequent fat deposit. Rarely, cheeks, women’s breasts, men’s breasts, inner and outer knees, calves and chin can also be subjected to liposuction, with some difficulty. Usually, it is good for people whose body weight is stable. Traditional liposuction used manual pressure and large cannulas to remove the fat tissue. Liposuction is entirely an aesthetics enhancing procedure. It can as well be categorized as a cosmetic treatment than a medical surgical procedure, now with the arrival of the latest technology. The latest technology laser assisted has further nullified the problems associated with the traditional liposuction. SAL (suction assisted liposuction) or traditional liposuction – it has a small straw like structure called cannulae, which is attached to a vacuum device. The fats deposits are removed by manually moving the device over the fat tissue. 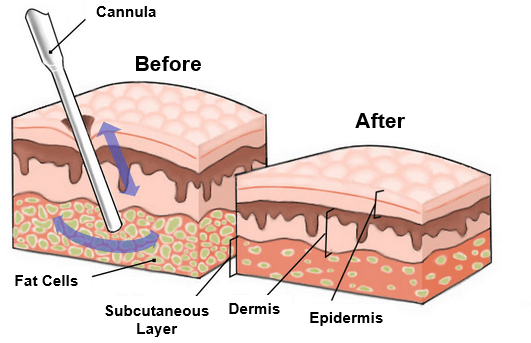 This process breaks the fat tissue, which is then sucked through the vacuum tube. This kind of liposuction involves the use of a specialized cannulae which emits ultrasound vibrations inside the fat tissue. It is easier to emulsify the fat tissue as compared to the manual method, in the ultrasound liposuction on. UAL is a good option for fibrous tissues, where removal through manual means is not effective. However, UAL takes even longer than the traditional liposuction. Power Assisted Liposuction – it has a cannula with mechanical movement, where the surgeon does not have to do much manual work. It is similar to SAL in all other aspects. Twin Cannula Liposuction – this procedure uses a specialized tube within the tube cannula, where one cannula is inside the other cannula. This mechanism reduces most of the manual effort of the physician. The added advantage of this procedure is that needles don’t get heated and cause tissue burns. The machine uses red light 650nm or invisible 980nm laser energy (cold and warm laser for slimming). As the laser beam penetrates the skin, it stimulates the fat cells. As a result of stimulation, the cell membranes release fatty acid and glycerol. Finally, the fat cells are burnt and suctioned away by the liposuction vacuum tube. 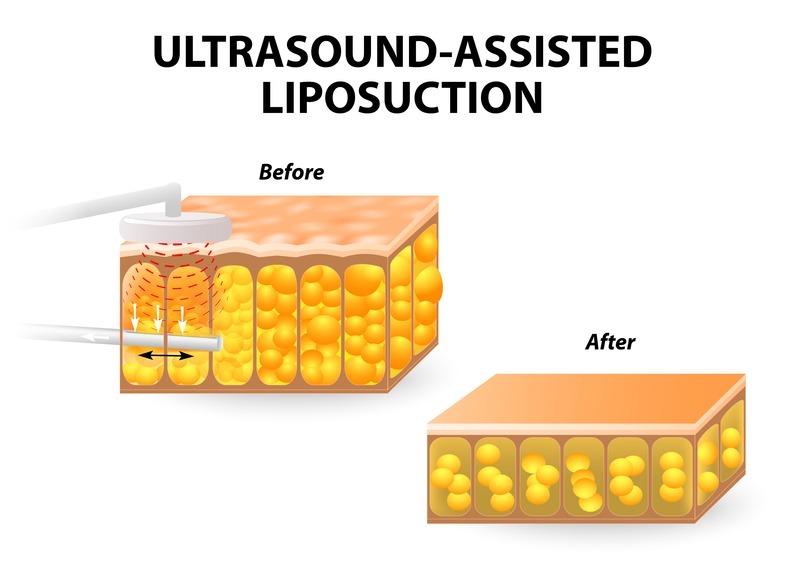 According to first-year market performance report of lipo laser, it has achieved results equivalent to liposuction. It has results to prove 30% decrease in the fat layer with just one treatment. The results of the treatment are immediately visible and improve significantly with consecutive treatments. Lipo laser is successfully able to reduce minimum 2-3 inches of fat in a single session. Laser liposuction can be used effectively even in the small parts of the body. Traditional liposuction can be used majorly only for large pockets of fat and is not very effective for small fat blocks. I lipo also can be used in all body parts as effectively as both of the above stated therapies. Laser liposuction provides a wider range of options for suitable body areas, incision size, type of anaesthesia used. It has better results in terms of the ultimate recovery. I lipo is the best as there is no surgery involved. The areas which suit traditional liposuction are only the large pockets of fats, for example – hips, thighs, stomach and love handles. Laser liposuction has a wider range of options in terms of areas covered, apart from the parts covered in the traditional liposuction, laser liposuction also covers knees, arms, bra rolls, upper abdomen, chin and other sensitive areas, which cannot be handled safely while using traditional liposuction. I lipo is also good for sensitive areas since it produces extremely mild laser beam, which is very safe to be used multiple times. In traditional Liposuction, large multiple incisions and sutures are made. The wounds take a longer time to heal and might develop an abscess. But with laser liposuction, only very tiny incisions are required (<1/4 inch). Because of use of a thin laser beam, tiny incisions are adequate. No sutures are made after the surgery since the incisions are so small. The healing rate is faster with the laser liposuction. I Lipo is in comparable to the above two as no healing is required. Laser lipo therapy is a far less aggressive method for fat removal. It uses instruments significantly small in size as compared to the traditional liposuction. Because of smaller incisions in the laser liposuctions, bleeding and bruising are significantly reduced. Again I Lipo offers fat reduction without bleeding or bruising. Since there are multiple large incisions made in traditional lipo therapy, large quantities of IV fluid is required because of a large amount of blood loss. This is easily avoided in case of laser therapy. Not applicable for I Lipo. In traditional therapy, the surgeon takes away the fat with his fingers from between the muscles and the skin. He might use a jabbing action to remove the fat. Many times the fat cannot be evenly removed because of manual removal. Also, this jabbing action by different agencies leaves a rippling effect on the skin after the procedure. This might leave an uneven tone to the skin afterwards. However, in case of laser liposuction, the fat is dissolved evenly and smoothly by the thin laser beam. Therefore skin retains its even tone after the fat removal. I Lipo gradually reduces the fat and gives ample time to a body to readjust to the changes, hence a more natural look. Traditional liposuction might use general anaesthesia since the incisions made are large in size and number. A patient administered general anaesthesia is advised to stay in the hospital for more days, however, in case of laser liposuction, only local anaesthesia is given. The overall procedure is less intensive and conducive to faster healing. Besides you can avoid the significant side effects of general anaesthesia in the case of laser liposuction. Not applicable for I Lipo. Traditional treatment might leave a lot of excess skin in the area where fat is removed. This gives a saggy look to the skin and it might take significant time to get the normal look. If the skin is not naturally elastic, one might get a loose skin on the site of fat removal. But in case of laser lipo therapy, there is a cauterization or tightening effect which leaves a more natural and smoother look on the skin. Even better results are achieved by I Lipo as no surgery of any kind is required. Traditional liposuction is just about removing the excess fat from under the skin. But laser lipo therapy induced laser beam heats up and stimulates the deep lying structures of the skin. Therefore new elastin growth and collagen production are stimulated in the skin cells. Collagen is a structural protein produced by the body. It is produced in low volumes as the age increases. But with laser treatment induced collagen production, the skin retain less number of nodes and bumps. This gives a smoother look to the skin after the procedure as compared to the traditional liposuction. Again, with I Lipo, no surgery, no complications. Traditional liposuction is very good at removing a large pocket of subcutaneous fat tissue from under the skin. But it works best where there is less fibrous tissue. However, it is not very effective in the tissues containing a substantial amount of fibrous tissue, such as bra rolls, posterior waist or upper abdomen. However, the laser liposuction works equally effectively on the fibrous tissue as well. I Lipo is almost as good as laser liposuction as the fats in fibrous tissues also respond to the thin laser beam of I Lipo. A larger swelling is left on the skin in the case of traditional liposuction, which might result in pathogenic infestation and infection. No such worries are there in case of laser liposuction. I Lipo is the best solution to achieve no complications fat removal. The scars left on the skin after traditional liposuction are bigger and multiple in number. However, in case of laser liposuction, the scars are hardly visible to the eye. No scars are formed in case of I Lipo. With laser liposuction, you can get moving within few hours of the procedure, which is not the case with traditional liposuction. Patients are advised not to drive after few hours of laser liposuction, that’s all. But with I Lipo, you can hit the dance floor immediately after the procedure! Better option for working people, with fast recovery time. The best and the most practical option for all. Can be used in large as well as small sensitive areas like the face. Can be used in all parts of the body. Can be effectively used on a fibrous tissue.